Most hedgehogs do not bite. 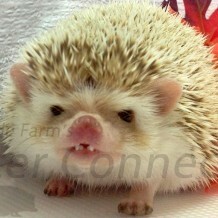 But, any animal with teeth has the potential to bite, so hedgehog owners must understand the possibility of getting bitten is always present. Hedgehogs aren’t like dogs, whose bites are usually intentionally mean or aggressive. Hedgehogs’ main line of defense is to ball up and use their spines for protection, rather than to bite. Hedgehogs do investigate the world around them with their noses, eyes, and mouths. If it does bite, your pig probably doesn’t realize it’s hurting you. Keep in mind that hedgehogs are *hard-wired* to put new/odd/unusual things in their mouths, chew on them, and then anoint. So, in a way, it’s a compliment your hedgie is biting you, because it finds you interesting. The good news is that hedgehogs’ mouths are designed to crush bugs and not fingers! Their tiny teeth and elongated jaws make it difficult to get in a good chomp, especially when compared to the average cranky hamster. You need not fear a hedgehog bite, but I want to make you aware that it can happen and help you to handle it. Proper understanding of hedgehog behavior will help decrease the risk and/or frequency of biting. Hedgehogs have fairly small teeth designed to crunch insects. They do not have typical rodent incisors or large-carnivore canines. The typical bite won’t feel good, but it won’t cause excruciating pain either. Imagine cricket-crushing strength! The reason your hedgehog bites will often determine how badly it hurts. A bite telling you “I’m mad” is going to hurt more than “I wonder if this is edible?,” but it won’t hurt as much as the “I’m really mad at you” bite. Finger bites typically hurt less than bites to softer skin between your fingers or on your arm. I personally have never had more than a prick to my finger or a bruise to my arm, but Nicole Gendler-Martin once described to me an extremely rare but particularly nasty bite that bled. That hedgehog had not been known to bite. Hamsters and other rodents deliver much more painful and bloodier bites than hedgehogs.